Following the running of two Distance (720m) NSW Nationals heats tonight (Saturday August 6) at Wentworth Park the box draw for the Macro Meats NSW State Distance final has been completed with Zipping Lad the early favourite. Jason Mackay’s Zipping Lad set the standard in the Distance series posting the fastest qualifying time of 42.25, dominating in heat one over Slick Lee and Mr. Meana. Zipping Lad which finished third in the Centrebet Magic Maiden series back in April has made a quick transition to the staying events with a high level of success. Trainer Jason Mackay believes Zipping Lad is a greyhound on the way up having only just turned two years of age. “He can’t be doing too much more than what he is doing at the moment, he is ticking all the right boxes,” Mackay said following the box draw. Zipping Lad will start from box four for the second week running, with Mackay pleased leading into next week’s $10,000 State final. “You can’t be too confident, but I do think there is something in him still cause he can’t have hit his best off just two starts over the distance. “Time will tell, but at this stage he looks like he will be a handy stayer,” Mackay said. Likely to start short price favourite Zipping Lad will meet inform NSW trainer Mark Gatt’s two representatives Mr. Meana (box three) and Beer Assassin (box eight). Beer Assassin’s owner Eddie Kingswell believes his stayer is capable of posting a competitive time come the final, after winning the second heat in 42.67. “He has posted around the same time as what Jason Mackay’s did tonight,” Kingswell said. “When you are in a final anything can happen and he tries his best the dog. “Since Mark (Gatt) has had him I think he has only been unplaced once so we know he will be thereabouts,” Kingswell said following the box draw. 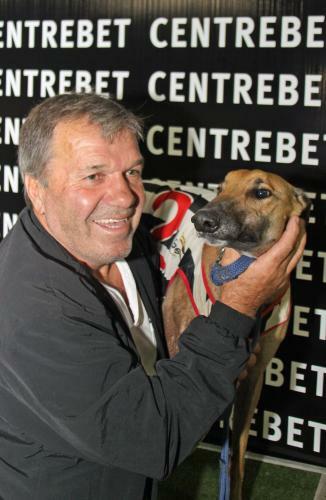 Keith Pedrana’s Slick Lee will have to await Victoria’s Distance Final result on Thursday to see if his greyhound increases its chances of going to Brisbane on August 25. Should Bobby Boucheau win the Victorian final at Sandown Park, then the door is opened for Slick Lee who can still make the National Final at Albion Park without winning the NSW State Final based on his current AGRA ranking. The winner of next Saturday night’s (August 13) State Final will take home $10,000 and earn the right to compete in the National Championship Finals on behalf of NSW. Winners from across Australia will make their way to the Distance Championship at Albion Park on Thursday August 25 where the overall winner will pocket $75,000. The National Final will comprise of the winner of each State Finals from NSW, Victoria, Tasmania and Western Australia, while the first two from Queensland State Final will represent the host State. The eighth position going to the highest AGRA ranked greyhound, which made their respective State Final but did not win. The stage is now set for a thrilling State Final next Saturday night (August 13) with gates opening at 5.30pm.